Amongst all the disagreements between the candidates in this year's Presidential election, there appears one economic policy both candidates do actually agree on. Unfortunately, this issue is based on a completely wrong underlying thesis. Is China a Currency Manipulator? What does it Mean for the US Dollar? In the Presidential debates, a heated topic has been the President's stance on China. The key takeaway from both candidates is that China's currency devaluation is a primary reason manufacturing jobs have left America for China. Again, in this week's debate that topic was front and center and again both candidates seem to be handicapped by lack of actual research on the subject. The problem is the data just doesn't support either candidate's view that China's weaker currency has been a negative factor in US manufacturing jobs. They need to find another scapegoat for the 30+ year deterioration of manufacturing jobs in America. Below is the updated research I originally published on 10/17 and shows why both candidates are wrong in their foreign exchange policy when it comes to jobs in America and what it may mean for the US dollar. China's Yuan is in a "controlled peg" relative to a basket of currencies. They control the exchange rate of their currency by purchasing the currencies of other countries, including the US Dollar, and many argue that the Chinese are buying a disproportional amount of dollars in order to keep their currency at a rate lower than it would be in a free market. This would allow them to produce (and sell) products cheaper as exports. If this is true, then there may be an argument that China (FXI - News) is "stealing" manufacturing jobs from the United States by attracting companies such as General Electric (GE - News), Ford (NYSE:F), and Caterpillar (CAT - News) with cheaper costs than would otherwise be available under freer market circumstances. As with most economic debates there are two or more differing opinions on the topic, but the majority of opinions is that the Chinese currency is undervalued. Some measurements that support such claims are the popular "Big Mac Index", the International Monetary Fund's analysis, as well as academic purchasing power parity studies. The Big Mac Index, which was popularized by The Economist magazine, measures the prices of a Big Mac burger in McDonalds (MCD - News) around the world adjusted for exchange rates. A Big Mac in China updated in July 2012 costs a US dollar equivalent of only $2.45. The average price in the United States is $4.33. This implies that the Chinese Yuan is undervalued by a little over 40% based on purchasing power parity. The IMF as well as some academic studies also support that the Yuan is being undervalued between 30 and 50%. But so what and has this really affected American jobs? Who is Correct - Romney or Obama? In the first debate, President Obama rebutted Romney's accusation that he was soft on China claiming, "as far as currency manipulation, the currency has actually gone up 11 percent since I've been president because we have pushed them hard. And we've put unprecedented trade pressure on China (GXC - News). That's why exports have significantly increased under my presidency. That's going to help to create jobs here." The chart below shows that Obama is correct in the short term as the Yuan has gained in strength since he took office, and Romney is correct over the long term. China's pegged currency has devalued significantly since its lows just above 1Yuan/Dollar in the early 80's to a high of above 8 Yuan/Dollar through 2006 and above 6 Yuan today. Since 2006 the Yuan has strengthened about 26% and since Obama took office in 2009, the Yuan has increased in value around 11% from just over 7 Yuan to just over 6 Yuan per Dollar. So, Obama is correct that the Yuan has increased 11% (but it also increased in the early 2000's as well). That value of just over 6 Yuan today would be more like 3 or 4 Yuan in a "freer" market. Keep in mind currencies are always measured relatively, so a strengthening Yuan implies a weakening US Dollar (UUP - News). If Governor Romney is elected it sounds like he will pressure the Chinese to continue to strengthen their currency. 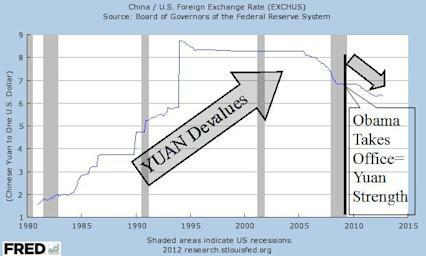 Prevailing wisdom is that if China's currency strengthens the US Dollar will devalue. If the US Dollar devalues then US goods become cheaper relative to other countries and manufacturing picks up as other countries demand our goods. To take advantage of a devaluing dollar, the bearish PowerShares DB ETP (UDN - News) moves inversely to the US Dollar and the Wisdom Tree Dreyfus Chinese Yuan Fund (CYB - News) takes advantage of a strengthening Yuan. If Obama is re-elected it sounds like a similar outcome is expected. He also likely will continue to pressure the Chinese to strengthen their currency. But will it really help the US economy (IWM - News) and manufacturing jobs? Against prevailing thought, academia teachings, and economic theory, a declining currency is not correlated with an increase in manufacturing jobs. This means that having a weaker US dollar and stronger Chinese Yuan does not at all mean manufacturing jobs will necessarily return to America. The below chart shows the US dollar since 1980 (top half) along with the St. Louis Fed's US Manufacturing Jobs Data since 1980 (bottom half). Together they sum up the manufacturing jobs debate quite nicely. Both candidates are wrong in their assumptions about the US Dollar and manufacturing jobs. Since the mid 80's the US Dollar has been in a long-term devaluation. Based on the candidate's logic, that would imply manufacturing jobs should be increasing in America. That simply has not been the case. Even in the 1980's through the early 90's when the Chinese Yuan devalued significantly by 700%, manufacturing jobs actually did not decline in America. 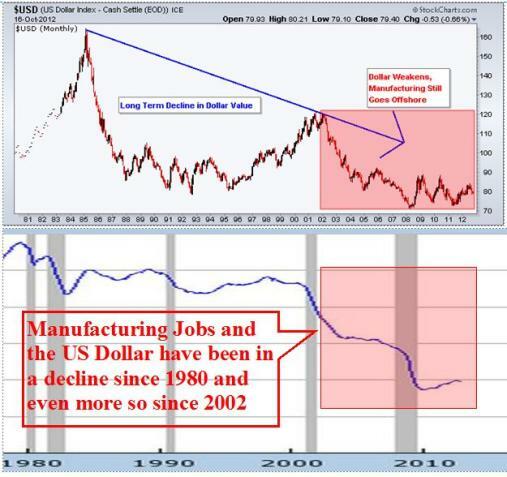 More recently, since 2002 (red shaded boxes), a decline in the US dollar's value has sped up, yet manufacturing jobs still declined, significantly. This is directly contrary to what both candidates are saying. There is very little support that a declining US Dollar amounts to more US manufacturing jobs. If anything, the analysis shows that a stronger dollar actually may be a better policy for attracting manufacturing jobs. In the late 90's the dollar strengthened and so did manufacturing jobs. More recently since 2009, the dollar also has stabilized and so have manufacturing jobs. Both Obama and Romney are wrong when it comes to China's currency manipulation and its role in the loss of manufacturing jobs in America. They need to look for other reasons besides China's "currency manipulation" for reasons US manufacturing jobs continue to decline. The November issue of the ETF Profit Strategy Newsletter analyzes various markets, along with a short, mid, and long-term outlook for the US markets. We monitor global events and formulate high probability profit strategies based on fundamental, technical, and sentiment research including the various "currency wars" and other mega investment themes. Will Bad Earnings Sink the Market?